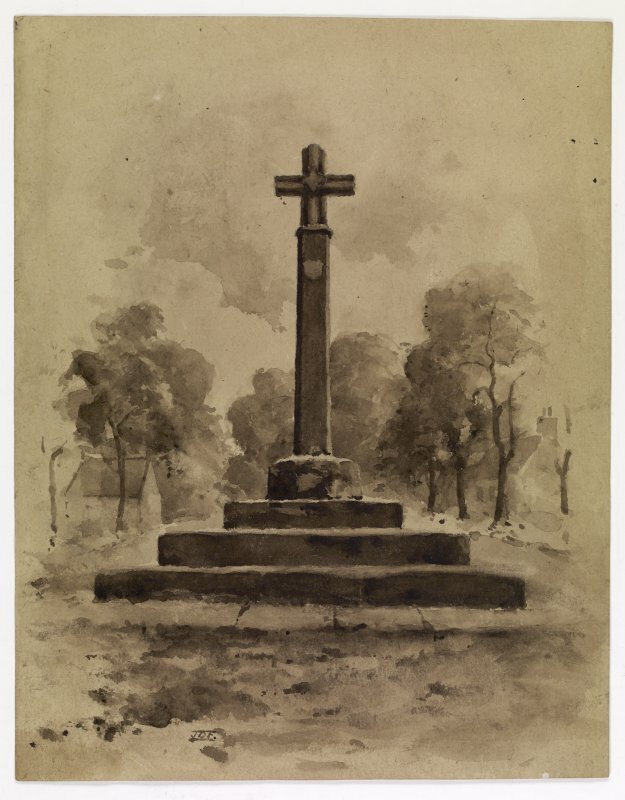 Drawing showing general view of Ormiston Market Cross. 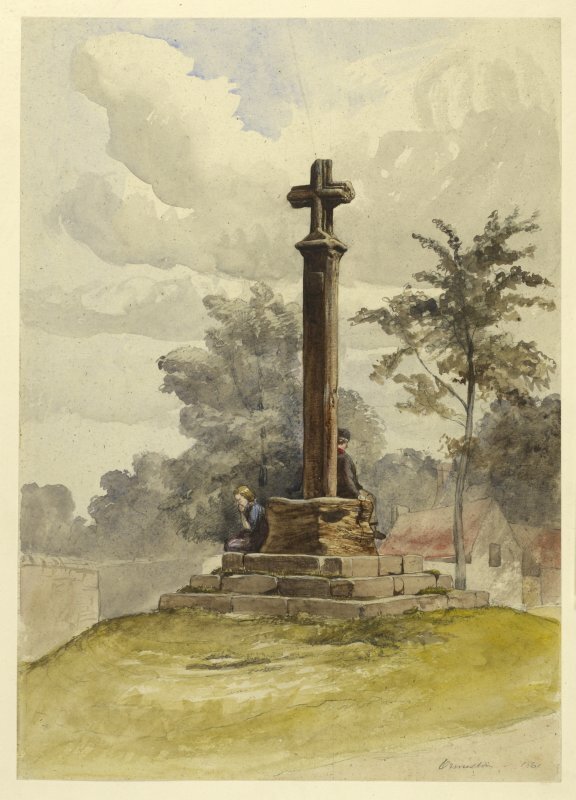 View of the market cross at Ormiston. 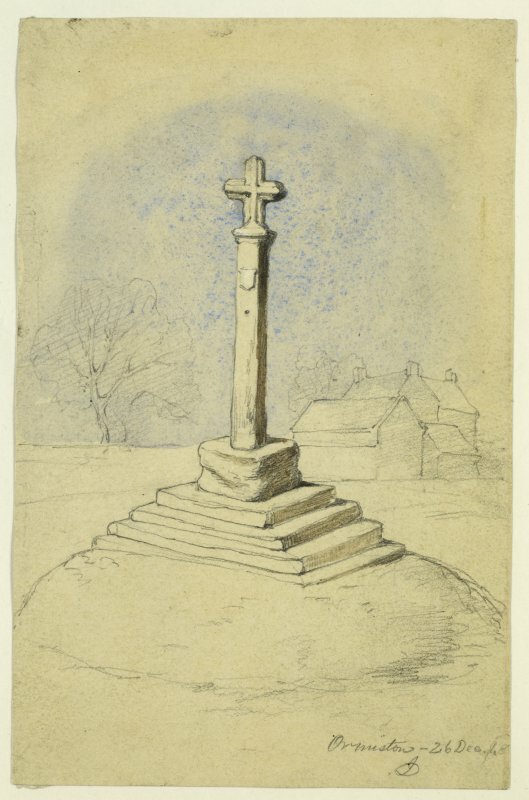 Drawing of Ormiston Market Cross. 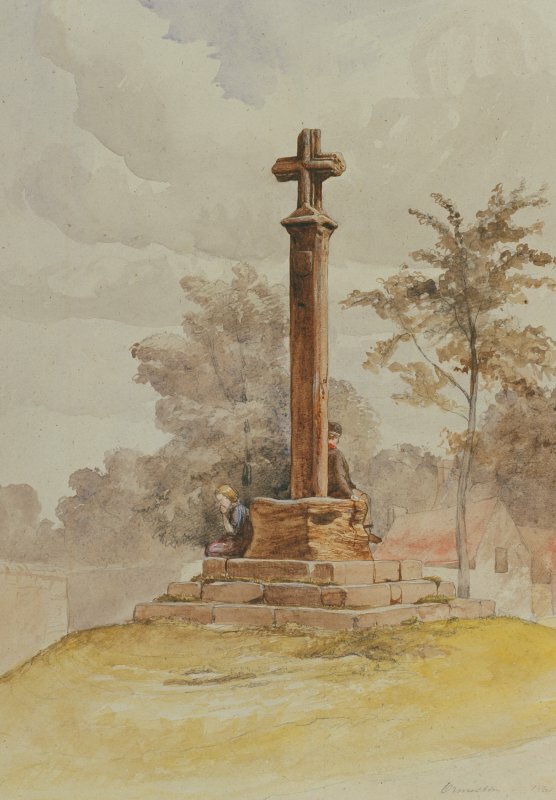 Watercolour showing general view of Ormiston Market Cross. 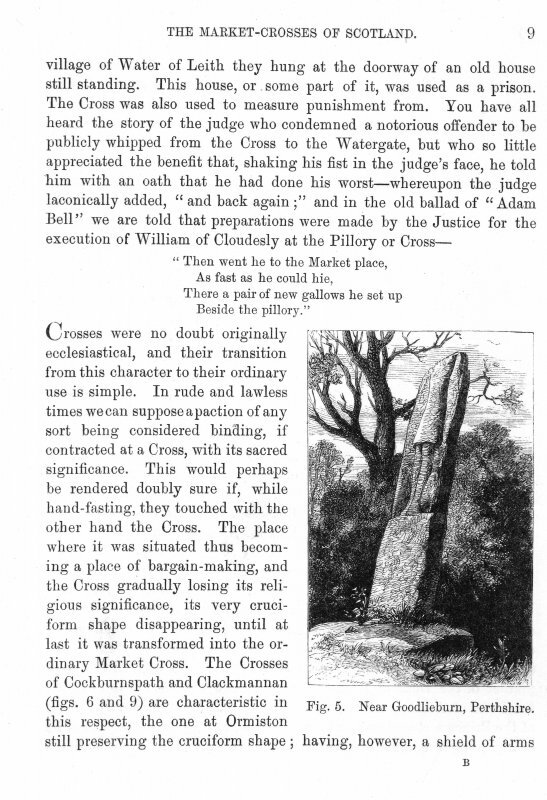 Ormiston market cross is a fine 15th century cross. Its square shaft, which is surmounted by a Latin cross, bears a sculptured shield of arms, the device on which is now defaced. It stands on a modern base. V G Childe and W D Simpson 1954; J W Small 1900. No change to previous information. Visited by OS(BS) 21 October 1975. 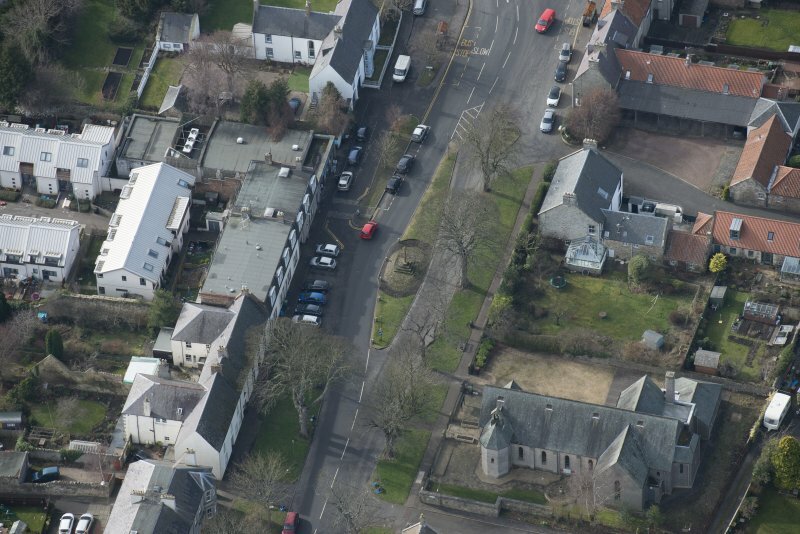 The mining settlement at Ormiston dates from 1903 when John Clark founded the Orrniston Coal Company. 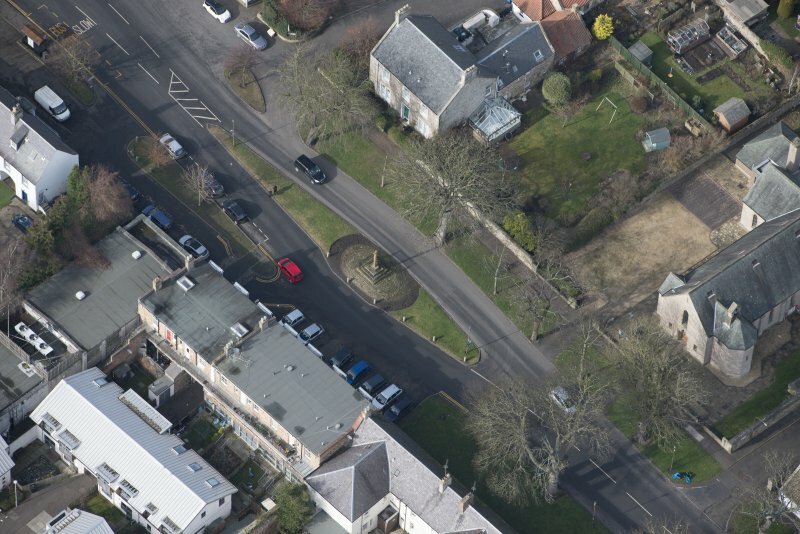 Previously the settlement, set on higher ground a little back from the north bank of the Tyne Water, was essentially rural; and the old part of the village owes much of its character to a former landowner, John Cockburn. Cockburn was a member of the last Scots Parliament; he subsequently sat in the English Parliament from 1707-41, and during his time in the south familiarised himself with new agricultural practices. 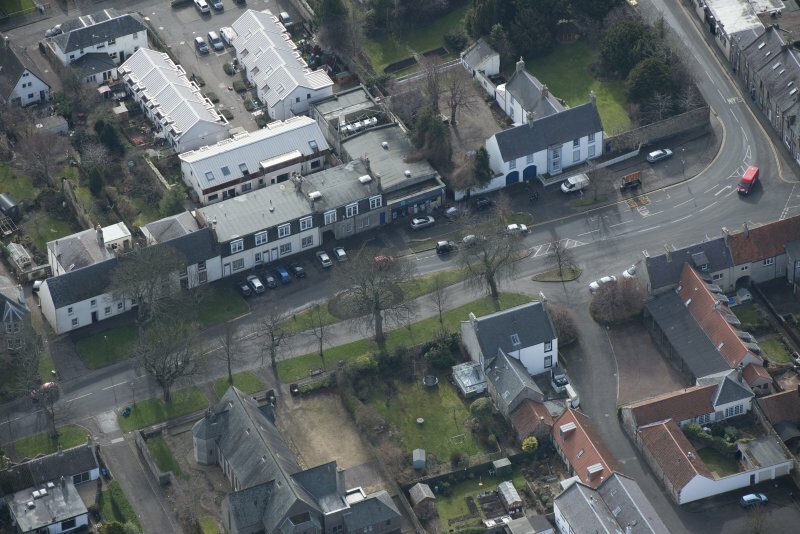 In 1736 he founded an agricultural society at Ormiston which met monthly in the village inn to discuss agricultural practices. He sent the sons of his tenants to England to learn new methods; he also founded a brewery and distillery to provide a market for local barley, and laid out a bleach field to support a linen industry, bringing skilled flax workers from Ireland and Holland. A laxspinning school followed. 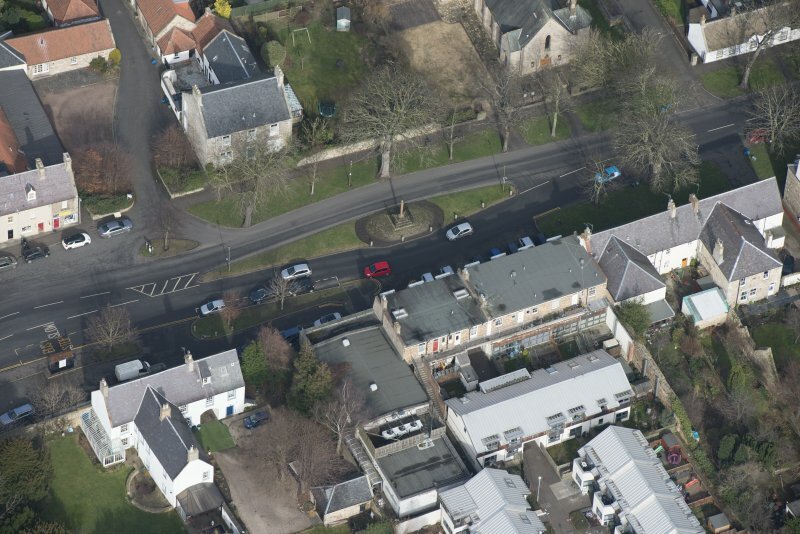 The enterprise was insufficiently profitable at the time, however, and in 1747 he was obliged to sell the village to the Earl of Hopetoun (see no. 30). 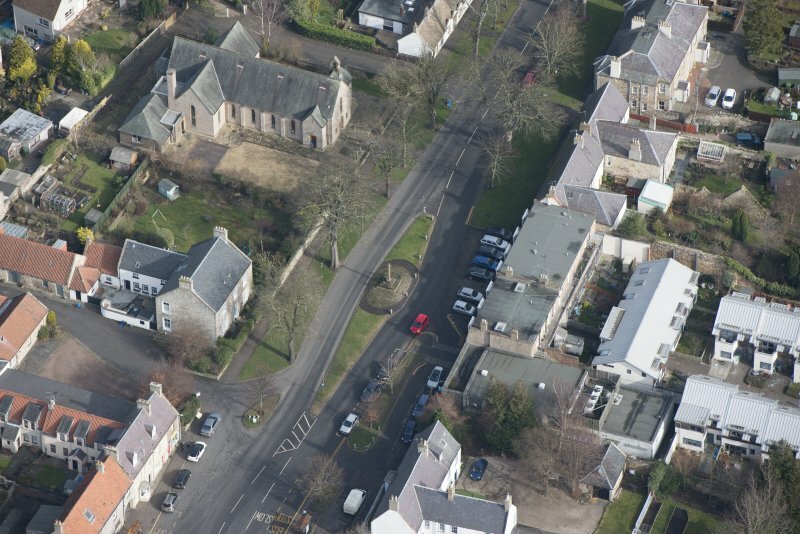 Cockburn's principal architectural legacy is his estate village, begun c.1736, a little to the east of the older mill-to un. 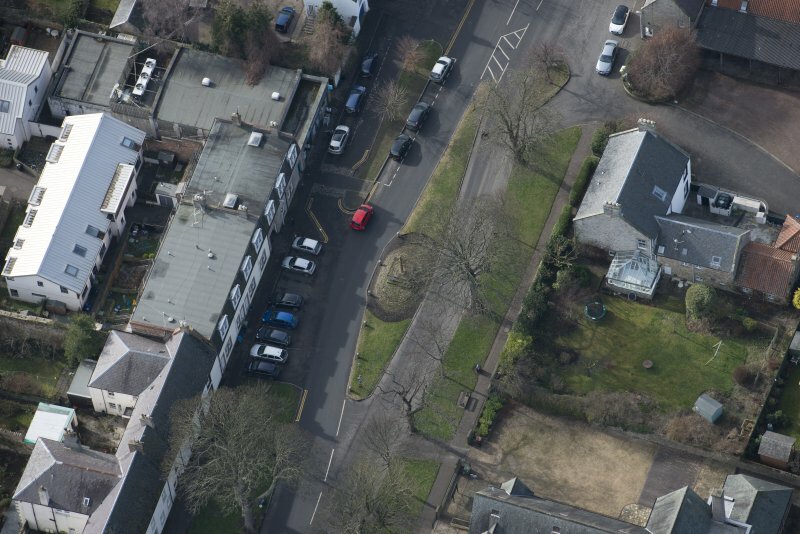 The wide, tree-lined High Street, 'closed' at both ends by 900 turns in the road, was to be a market centre; the new housing accommodated local craftsmen and the cottage textile workers. 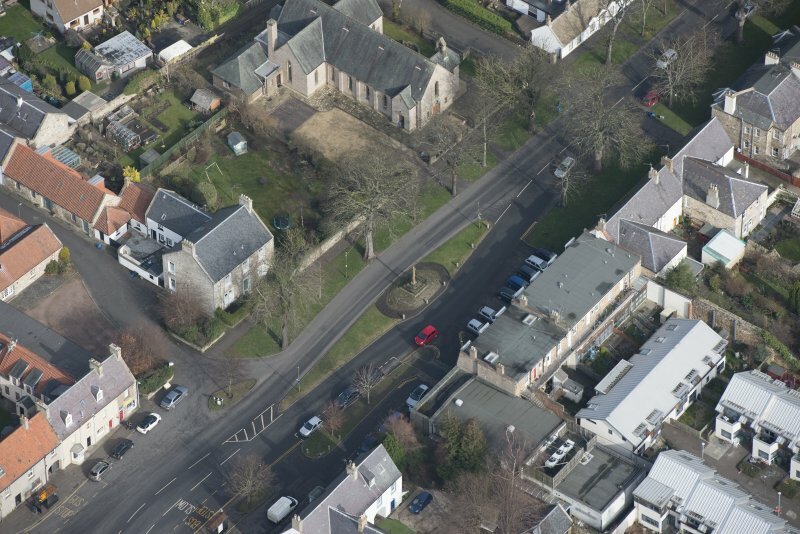 He provided the building materials himself, and expected high standards: "I can give my consent to no houses being built in the Main Street of the town but what are two storeys high". 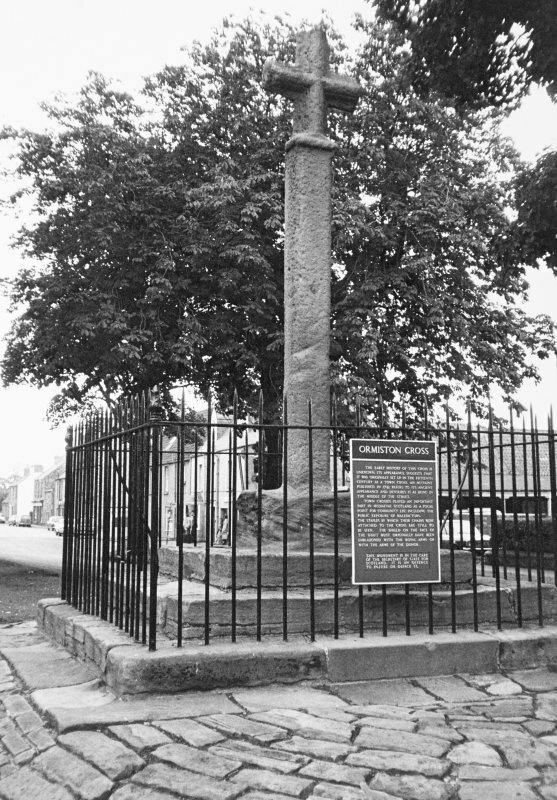 The fine mercat cross stands in the middle of the High Street It dates to the 15th century, a rare survival of a truly cruciform, pre-Reformation 'cross" It may have been associated with a chapel standing across the present street, or it may have come from elsewhere, revitalised as a focus to the new village. The old base is octagonal, set above modem steps. 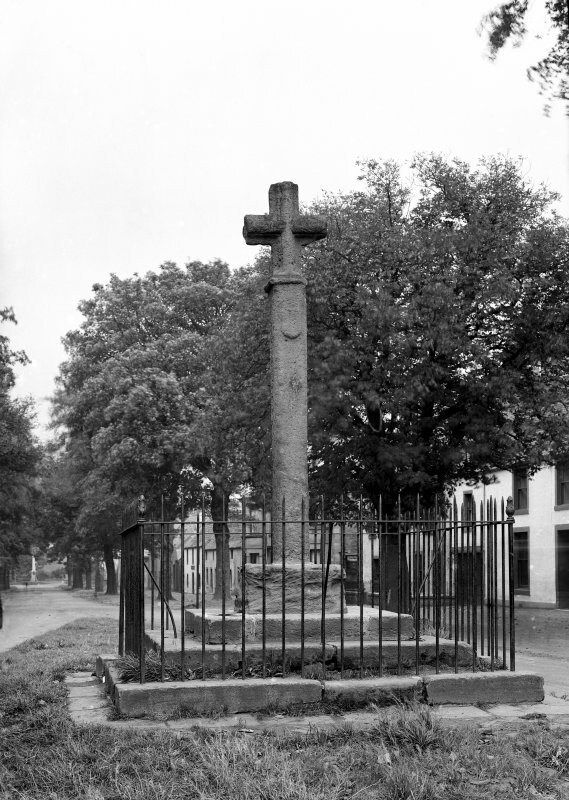 The square-sectioned shaft carries a shield on its western side; the cross-head stands above the moulded 'neck'.